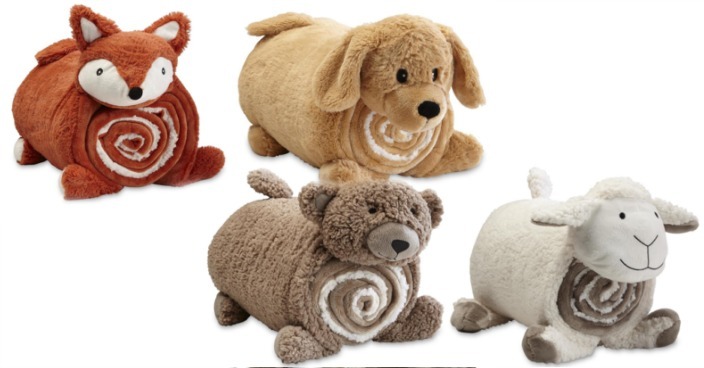 Kids' Sherpa Cuddle Friend & Throw Set Only $9.99! Down From $20! You are here: Home / Great Deals / Christmas Deals / Kids’ Sherpa Cuddle Friend & Throw Set Only $9.99! Down From $20! Kids’ Sherpa Cuddle Friend & Throw Set Only $9.99! Down From $20! Kmart has this Kids’ Sherpa Cuddle Friend & Throw Set on sale for $9.99 (Reg. $20)! Plus you can get FREE in-store pickup or FREE shipping on orders over $30! It’s fun to kick back in the car, in the living room or at grandma’s house with this kids’ Cuddle Friend throw and pillow. With a plush head, feet and tail, this cute pillow features soft and cushy fleece. Two hook-and-loop fasteners securely hold the throw which rolls up for convenient storage. Use as one big pillow, or use separately to create a comfortable place to rest. Final: $9.99 PLUS FREE in-store pickup or FREE shipping on orders over $30!